When people think printing, a lot of the time they think small, as in small paper products. Invitations, brochures, mailers, postcards, or even booklets and magazines… But what if you thought big? Like really big. Fun fact: That’s not real brick in the first picture, or real wood in the last picture. Think of that blank wall in your office. You know, that one you’ve been looking for some piece of art to put there to fill it up? Think of that hall that you walk through to get to your office. It’s long and blank. Or maybe it has a framed picture or two in it, but nothing really eye-catching. Think about your stairs. Or, if you have one, elevator. What about the outside of your building? The windows? Your signage out front? Have you realized there may be more blank spaces at your workplace than you previously realized? When people think of marketing their brand, they often think of what they are sending out through materials like brochures, mailed collateral, and social media. However, communicating your brand personality inside a building is also equally important. When customers, students, family, or whoever your audience may be, walk into your space, it needs to match the personality you are presenting to the outside world through your smaller print collateral. Wide format printing is something people don’t often think of when considering their workplace, but it something that can definitely help your personal and brand personality when those blanks are filled in. 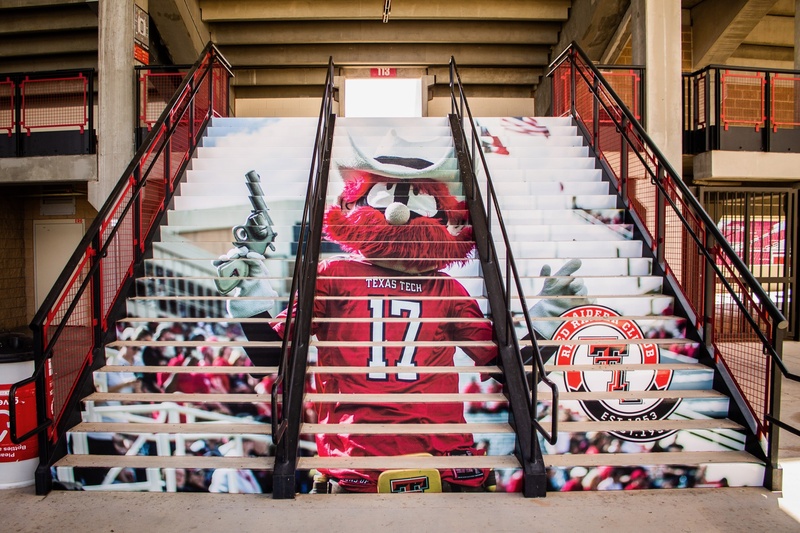 Wide format consists of things like wall wraps, stair wraps, acrylic, brushed aluminum, vinyl, and so much more. This display that can easily be changed out as needed to match the seasons, announcements, events, etc. Like the examples used throughout this blog, Slate Group is constantly working to make sure our space represents who we are. When you can express yourself, you are more comfortable. That’s just a proven fact. So whether your brand is a school, athletic team, church, airline, or printing company, you have a personality and it needs to be shown. Fill in the blanks of your brand by filling in the blanks on your walls. Below are examples of wide format projects. For more information on our wide format printing capabilities, go to www.slategroup.com/wide-format-printing/ or scroll through our Inspiration tab.